If you need a Configuration Profile specialized at the node level, define a node-specific config profile. An installed version of Python 2.6 through 2.7 is required on the target nodes. LCM does not automate the installation of Python. Install jobs fail if Python is not installed. Select the cluster and its datacenter to which you want to add a node. Click the + plus sign above the Nodes pane. The Add Node dialog appears. The *asterisks indicate required fields. The Address fields display the default values that are used if no values are entered. Required: Enter a Name for the node. Required: Enter the SSH IP Address. Rack Enter the name of the rack. If a rack is not entered, the rack name default is rackn. Example: rack1. 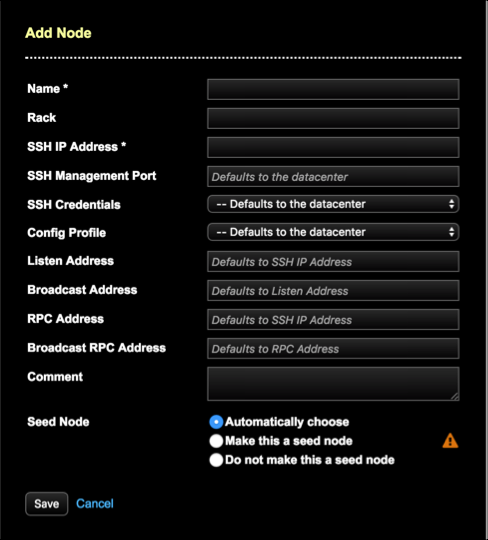 SSH Management Port Enter a port value if you do not want to inherit the value from the datacenter. Default value for SSH port at the cluster level is 22. Config Profile Select a configuration file to apply at the node level, which overrides inheriting the configuration profile from the cluster or datacenter levels. Defaults to the datacenter config profile. RPC Address Default: SSH IP Address. Broadcast RPC Address Default: RPC Address. Automatically choose: (Default) Allow Lifecycle Manager to select a seed node. LCM designates 1 node per rack in each datacenter, or two seeds per datacenter if a single rack is defined. Do not make this a seed node: Select to explicitly exclude the node from seed node designation. Note: It is a best practice to designate more than one seed node per datacenter (ideally two per datacenter); however, do not make all nodes seed nodes. Please read Internode communications (gossip).